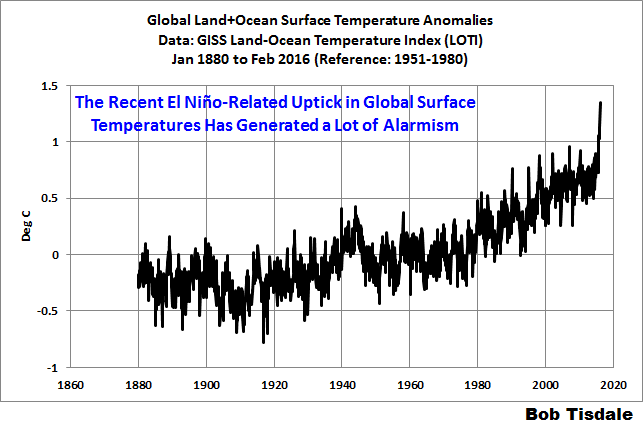 The AGW alarmists seem to think the Feb 2016 sudden uptick in temperature is caused by Co2, this is not the case, its a strong El Niño - as it matches what has happened before. Given the current screaming and shouting going on in the media with respect to the February 2016 temperature increase in the GISS Land-Ocean Temperature Index, you would be forgiven for thinking the end is nigh - well it isn't. This has happened before and we survived without issue - its called a strong El Niño. The above chart shows the changes differences one month from the next, as can be seen by the red line, the February jump is nothing odd. The February uptick in temperature is nothing more than a strong El Niño impacting on the monthly temperature measurements - i.e. business as usual. For more detailed background info I refer you to this article.